In about 10 minutes we saw movement again. It was the bigger doe. She was behind heavy brush and trees but she once again gave me a couple of shots. Again I waited for Ron to find her in his scope but the angle was not good. Where the doe stood there was a two-foot gap in the trees. I felt that we might not get another shot and asked Ron if I could shoot. He answered yes and I took the shot with my Remington Model 700 .25-06. She dropped where she stood. Suddenly the smaller doe, who we did not know was there, took two steps out from the brush and gave Ron a perfect broadside shot. 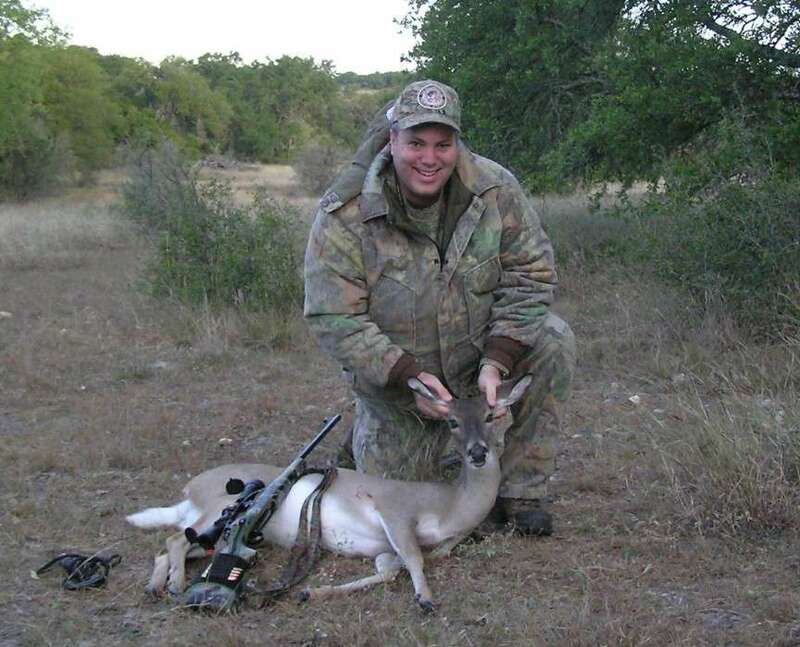 He took it with my Browning A-Bolt .30-06. The doe jumped from the impact and ran away from us with its front legs low. I lost sight of her in the heavy brush 10 yards behind the feeder. We waited 30 minutes as I wanted his doe not be pressured and run further away. After half an hour we went to find our does. We found mine first, right where I had shot her. We then went to where Ron had shot his doe and found a very heavy blood trail. We found her about 10 yards past where I lost sight of her. We tagged them, dragged them to the dirt road, and went to get Ron’s truck. On the way back we stopped by the blind to get our gear. As we were putting it into Ron’s truck we heard what I thought was a snort. In about five seconds we heard another one. We got the rifles, loaded a round, and leaned against Ron’s truck and waited. The deer continued to snort intermittently. All of a sudden a doe walked right out in the open. She started to walk towards heavy brush, but Ron foiled her escape with the A-Bolt. She ran straight away and fell behind a bush. I was pretty sure that she was down so we didn’t wait this time. We found her about 10 yards further from where I had seen her go down. We loaded the deer and took them to the cleaning area. Within an hour or so we had the three deer in ice chests. We put the guts and hides in large heavy duty trash bags, loaded them, and went to dump them. As we drove down a dirt road I saw some dark shapes in a grove of trees. Ron stopped his truck and my binoculars confirmed what my eyes had told me – turkeys! We quickly got my guns out of their case. I used the hood of Ron’s truck as a shooting rest. 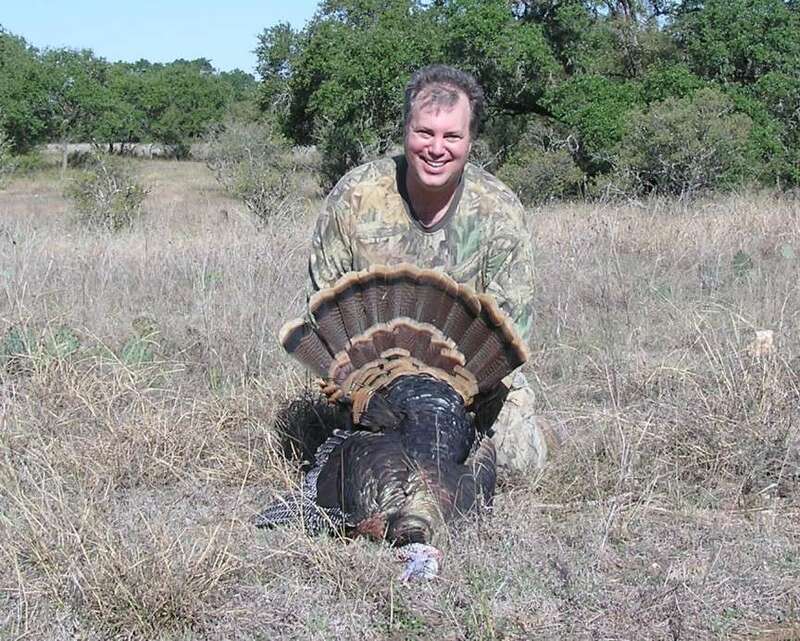 I had a shot at a Tom that was walking away but waited for Ron to pick one out also. But he couldn’t find one in his scope. My gobbler turned around and went into brush. In about 15 seconds it returned. I once again had a shot but as I waited for Ron, the bird went into heavy grass and I lost sight of it. In about 10 seconds I located what I thought was the first Tom and now he had another Tom right behind him. They were walking away from us. There was only about a one-foot gap in a group of trees and brush and I told Ron that I had a shot. He still couldn’t find them in his scope and said to take the shot. I let loose a round from my .25-06. One turkey flew to the left and another to the right. I feared that I had missed. We went to where the Tom was when I shot. As I walked across the field I saw a dark shape that looked like a burnt log. When I was about 20 yards from it I recognized feathers. The bird hadn’t taken a step. It weighed about 20 pounds and had about an 11” long beard. I’ve had more productive days afield but regard this as one of my best. 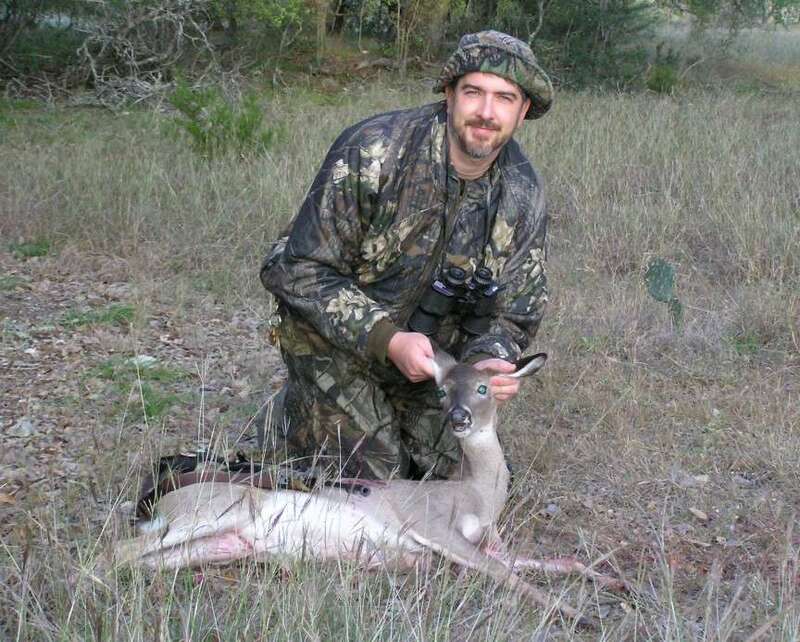 Besides killing my first turkey, I got to hunt with a good friend and witness the birth of a deer hunter. Jesus knew what Nicodemus was going to ask and provided the answer before he could get the question out. ‘Born again’ means ‘spiritual rebirth,’ or a ‘regeneration of the human spirit from the Holy Spirit.’ Being born again, is where God acts to impart eternal life to a person who believes. When we believe in Jesus and profess that he is our Lord (see Romans 10:9) we become children of God. Nicodemus misunderstood Jesus’ statement and thought that he was speaking of physical birth. He asked Jesus to elaborate. Jesus explained that no one can enter the kingdom of God unless they are born of water and the Spirit. Our bodies (flesh) give birth to new flesh, but the Holy Spirit gives birth to spirit. What Nicodemus didn’t ask is, ‘Why do I need to be born again?’ Perhaps that is because, as a teacher of the law he knew that everyone sinned and fell short of God’s standards (see Romans 3:23) and that the penalty for that sin was eternal separation from God (see Romans 6:23). He also knew that salvation from works and trying to keep the law wasn’t the answer. What he didn’t know was how he could be saved. He needed a spiritual transformation. Just as with Nicodemus, there is much confusion today over what it means to be “born again.” The term became popular in mainstream society in 1976, when Jimmy Carter, who said he was a “born-again Christian,” was elected the 39th United States president. People visualize like Nicodemus did trying to enter into their mother’s womb as adults and know that it is impossible. Christianity adds to the confusion unfortunately, as various denominations define born again slightly differently from one another. Yes, there are minor differences, but because Jesus declared that we all must be “born again” every Christian denomination has a doctrine of spiritually rebirth. The Lord said in Ezekiel 11:19-20 NLT, “And I will give them singleness of heart and put a new spirit within them. I will take away their stony, stubborn heart and give them a tender, responsive heart, so they will obey my decrees and regulations. Then they will truly be my people, and I will be their God.”” Being reborn spiritually awards us with a new caring and receptive heart. Have you been born again? If you’re like Nicodemus and are not sure, I encourage you to read God’s Trophy Room. Just like on that cold November day when a deer hunter was born, we all must be born again in order to see heaven and experience God while we remain on earth.